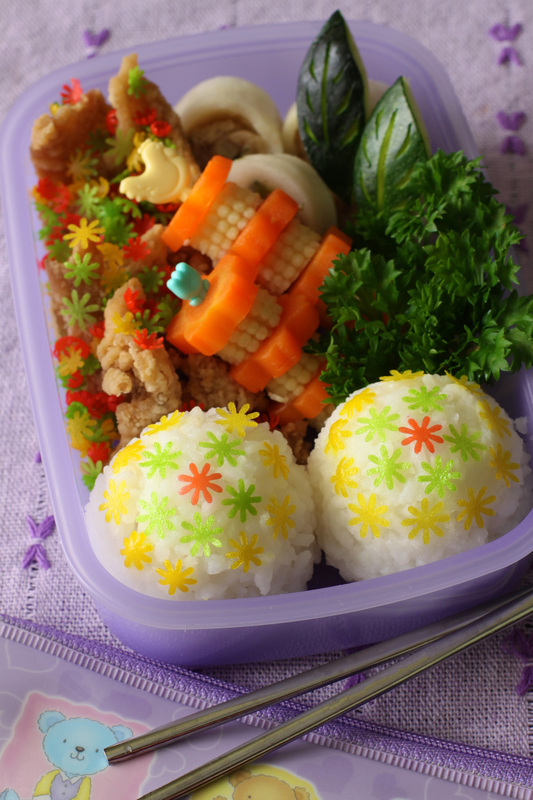 This bento was for my daughter. I made lunch box instead of snack box for her because she had to practice drama for one and a half hour after the exam. I put 2 rice balls, thin sliced fried chickens, carrots & baby corns, fish balls stuffed with chicken minced, and leaf shapes zucchini. I also made some small flowers with 3 colors from the egg sheets. Punched them with the puncher and put them on the top of the rice balls and thin sliced fried chickens. @Lil'chan : Thanks a lot Lil'chan! I use some drops of food coloring for the egg sheet to make them colorful. Just don't pour too much on the non-stick pan then you will get a thin egg sheet. I rinse my puncher after use with water and soap and dry it quickly with my hair dryer hehehe :) That's what I do to keep them clean. Hope your kids are doing good in thier exam. 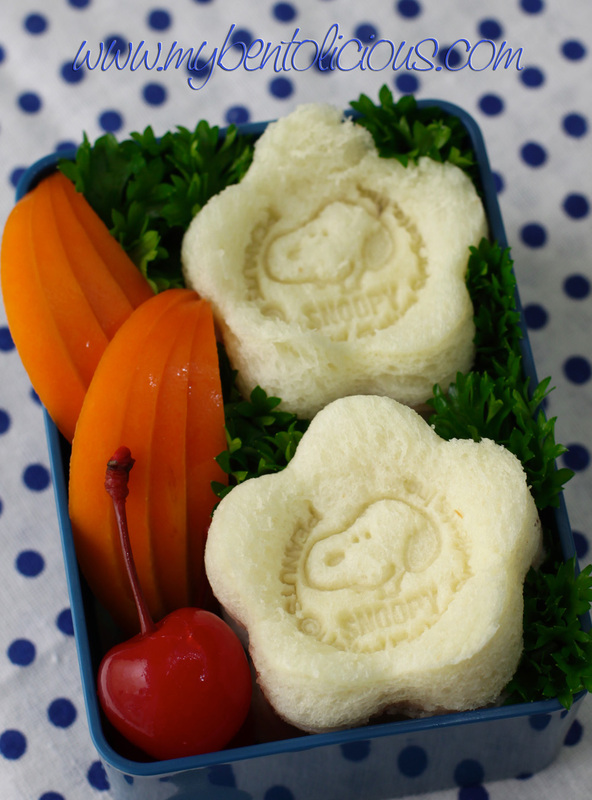 Your Snoopy sandwich looks perfectly fine, simple & nice. Lia Chen, where u normally order bento tools? @Vanessa : Thanks a lot Vanessa! I usually ask my friend to send it from Japan or from Daiso in Jakarta & Singapore. But this couple of months I have been buying online on http://www.nst.my and http://www.bentocraft.com, they are in Malaysia so the shipping fee to Indonesia will not too expensive. I'm never be creative for my lunch box. lia how did you get the colored egg sheets SO THIN?? you made them yourself like crepes? i see your comments to lil'chan about the color, i will definitely have to try this. @Rara Pramasasya : Thanks a lot Rara ... Wah asyik nih temen nge-bento nambah lagi. Ayo donk di-posting biar rame nih Ra!